Vintage framed print, which may be from Donald Art Co., Inc. 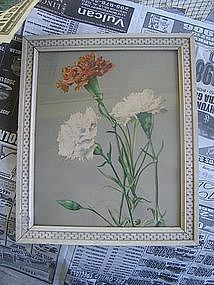 I can't see the manufacturing information, but this print is part of a set of framed florals, and some of them are marked as Donald Art Co., Inc. The wooden frame measures 12 1/4 x 10 1/2 inches. There is some loss to the finish of the frame and general aging to the paper. There are some areas of reflection, not to be perceived as damage. Complete condition photos by email. I need your zip code to calculate the postage.